I wrestled with this episode because I knew I wanted to focus on a book or books about General Electric’s spectacular leader Jack Welch. I didn’t struggle about my opinions of Mr. Welch, but rather the vast number of books I’ve read about him and about how GE operated during his regime. There are others, too. I think I’ve purchased and read every book written about Jack Welch, including the ones he’s written – those with or without his wife, Suzy. I decided to focus on this book written by the Welch couple because it’s a good distillation of Jack Welch’s ideas, philosophies and beliefs. Yes, it’s clearly from his perspective and so it naturally has his biases built in. Like most extraordinary people he’s got his detractors. Many of them are quite zealous in their criticism of his work at General Electric. He ruffled feathers because he took action. Sometimes people thought the actions he took were extreme and unfair. Nobody can argue with his ability to return value to shareholders though. Under Welch’s leadership, GE increased market value from $12 billion in 1981 to $280 billion in 1998, making 600 acquisitions along the way. Earnings grew 10 fold to over $14 billion. GE stock prices rose from just over $1.25 per share in 1981 to a peak of $60 in 2000. Wall Street loved Jack. One of the biggest criticisms of Jack Welch was that he lacked compassion for the ordinary, middle-class worker. I think much of that perception stemmed from his open support for strong executive pay. Welch was opposed to restraints on executive pay. He wasn’t concerned with the gap between the pay of an average worker and the executive. He continues to be a strong advocate of the free market and believes that whatever the market will bear is fair game. Whether you agree with his tactics or his philosophies, you must recognize his dedication to follow what he believed was right. Personally, I found Jack Welch refreshing and in keeping with my fondness for Harold Geneen and others, I found Welch had that one quality I most admired – and still do – candor! 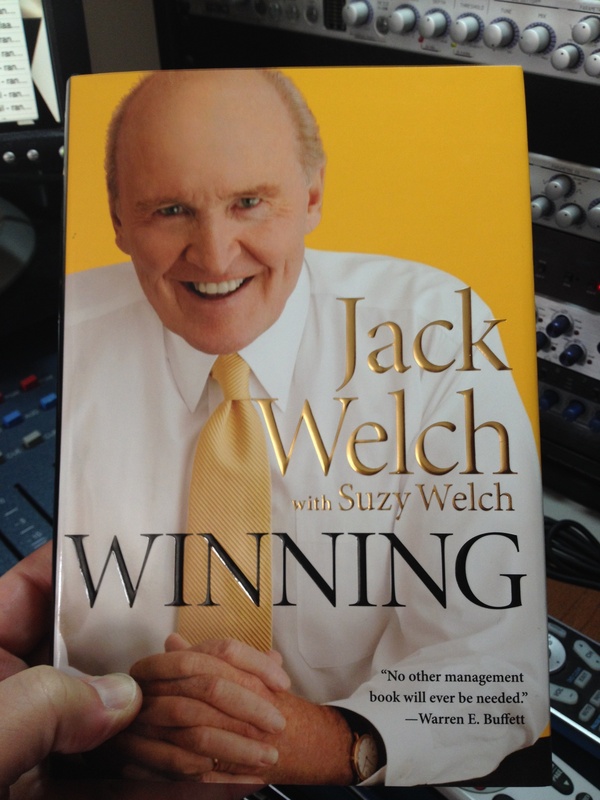 Winning by Jack and Suzy Welch may not have been THE book about or by Welch to help define me, but there’s no doubt that watching, reading and learning about Jack Welch during his GE years helped shape my own beliefs about running business. I was in the early days of my management career when Jack Welch was hitting his prime at GE. By the time I was well entrenched in my management career I had made some connections with General Electric because they were a supplier. I was running a luxury retailing company in Dallas selling high-end major home appliances and consumer electronics. A new regional manager for GE Appliances arrived in Dallas, Len Kosar. We spent hours and days together as part of a “smart bombing” initiative of GE to study and research the appliance business. Through that process, the GE manager learned that I was a big fan of Jack Welch’s work. Today, Len is President and CEO at Evive Station in Pittsburg. He quickly cited a champion, who not only suffered him, but promoted and protected him. Welch went on to do that for people he felt were the “top people” at GE. By the time I shook hands with Welch he was well into the famous 20/70/10 routine where he was dedicated to firing the bottom 10% of GE’s team. That first number, 20, represented the stars. Welch believed in taking care of the stars. As for the middle number, the 70 – he knew they were vital, but he also knew some could slip to the bottom 10 while others could be nurtured to the top 20. He wanted to exert pressure on that middle 70 to join the ranks of the top 20%. Welch himself had been a top 20 and people had fostered his growth inside General Electric. They were instrumental in shaping his views and in giving him the opportunity to fulfill his goal to one day become CEO of the company. Very early on in my career, when I began following Jack Welch through the press and books, the thing I most admired about him was the thing others found repulsive. He was blunt. He was candid. Shameless in telling people where they stood. It’s safer to say that all my reading and studying of Jack Welch helped define me as a business guy, more than simply blaming it on just a book. But since this series is about books that helped define me I’m singling out this book by Jack and Suzy Welch, Winning. The book was published in 2005. Jack: Straight from the Gut by Welch was published in 2001. It was more of an autobiography. You should buy it ’cause like the other books I’ve talked about up to this point – you can grab a copy for a penny! Welch was clearly hitting his stride in a new career as an author and speaker by the time Winning was released. The book is divided into five sections and twenty chapters. – People Management: You’ve got the right players. Now what? If I have a single favorite chapter of a business book, Welch’s chapter about candor ranks right at the top. For good reason. Welch took as much static for his concept of differentiation as maybe anything, based on what I read through the years. He always admitted that the numbers may not be precise, but he staunchly believed there were three basic people: top performers, the people who are vital and the bottom performers. The math he used was 20% at the top, 70% in the middle and 10% at the bottom. Welch mentions the criticisms in the book. Simply put, Welch felt it was unfair to protect the bottom performers. It wasn’t just unfair to the company and other, higher performing workers, but he felt it was unfair to the bottom performing people, too. Practical, powerful and wise. Yes, it helps that I respect the work of the author. I’m aware that some see Jack Welch as a villain, Neutron Jack. His mantra, “Control your destiny or somebody else will” was among the most powerful phrases on my business philosophy. But I’m a guy personally adverse to the whole notion of entitlement, pay raises for everybody and “we’re all equal.” It’s not true. It’s unrealistic. The book is filled with practical, workable advice by a man who exercised everything he writes about. He’s not some professor pontificating about what might work. Welch did it. Well. And no matter how people feel about him, there’s no doubt he knew how to win. He knew processes mattered because he embraced Motorola’s Six Sigma and then improved on it. But he focused heavily on getting, developing and retaining talent.